The Geese and the Fig Tree ~ The Wise Old Bird Panchatantra Stories No Reviews Posted. In a part of the woods was a big fig tree with huge branches. A flock of geese lived there, and happy they were, you can be sure of that! But at the roots of the tree, a little vine was starting to grow. So they let the vine grow. And it grew. And grew. And grew. 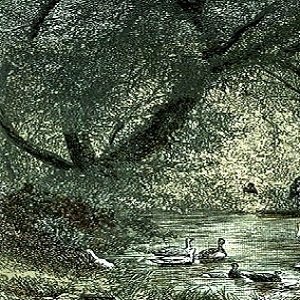 When the geese were out one morning catching bugs and little fish, a hunter saw the fig tree and the big, thick vine. Why it was so big and thick, he could climb right up on the vine! So he climbed and high up in the branches, he laid a net around the nests. Then he quietly climbed back down. That night after a day of food and fun, the geese came back to their nests. Each and every one of them became stuck in the hunter’s net. “Why, oh why did this happen to us?” cried a goose. “What do we do now?” cried another goose. At sunrise the next morning, the hunter came back. At first, he was very glad to see so many birds in his net in the fig tree! But when he got closer, he saw that every goose seemed as good as dead. He did not want dead geese so one by one, he took them off his net and threw them onto the ground. The geese stayed very still on the ground until the very last goose was thrown onto the ground. Then the hunter climbed down the tree and left. When the geese could not see him anymore, they flew back up into the branches of their fig tree. The geese knew what they must do. It took a very long time, but bit by bit, they pecked away at that big vine. First, they cut the big vine into lots of smaller pieces. Then they pecked away at each small piece until it broke from the tree. At last, every piece of vine fell to the ground. And the geese could fly up to live safely in their fig tree, once again.